Having appropriately propitiated the curricular deities, it appears that this coming fall, I’m going to be teaching a graduate seminar in linguistic anthropology on the topic of Language, Culture, and History. The readings will be drawn from linguistically-oriented historical anthropology and ethnohistory, anthropologically-oriented historical sociolinguistics, and linguistically-oriented archaeology, if that makes any sense. Maybe not? Anyway, last night I put together my ‘long list’ of 40-odd books that we might potentially read. Some of these will come off the list due to price or availability. Others I haven’t looked at thoroughly yet, and when I do will come off because they aren’t suitable. That might get me down to 25, but then I’ll need to get it down to 13 or 14, one a week. The rest can go on a list from which individual students can pick to do individual book reviews and presentations. Here’s the list, below. Additional ideas of books that fit these general themes would be welcome. Any thoughts? Neolithic Chinese sign-systems: writing or not writing? The Guardian just reported today on a find from Zhungqiao (near Shanghai) of artifacts bearing writing-like symbols that date back over 5,000 years. If this were substantiated, this would take the history of Chinese writing back an additional millennium or more from the earliest attested ‘oracle-bones’ and other inscriptions of the Shang dynasty. The article reports that the artifacts in question were excavated between 2003 and 2006, and the information is both slight and non-specific, and doesn’t link to any specific publication as of yet, so it’s difficult to know how, if at all, this relates to the host of other reports of writing or writing-like material from Chinese Neolithic sites (the Wikipedia page on Neolithic Chinese signs is quite extensive). The signs from Jiahu are much older than those of the newly reported find, for instance. I think that the difference that’s at question, and discussed in the Guardian piece, is the presence on some of these artifacts of series of several signs in a row, thus suggesting sentence-like structure rather than, say, ownership marks or clan emblems or just decoration, which is what most of the other Neolithic signs have been determined to be. I have to say that, if the stone axe pictured in the article is representative of the new finds, then I’m dubious of the entire enterprise – those do not look, to me, to have a writing-like nature, and some of them may not be ‘signs’ at all. I hate to be so negative, but the tendency to announce finds in the media that never come to anything in publication is so great that we should indeed be highly skeptical when such announcements are made in the absence of a published site report or article. The wd3t is the eye of the falcon-god Horus, which was torn into fragments by the wicked god Seth. 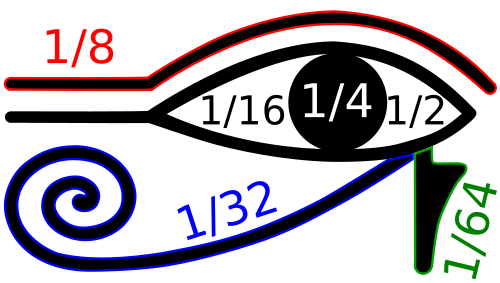 Its hieroglyphic sign is made up of the fractional powers of 2 from 1/2 to 1/64, which sum to 63/64. Later, the ibis-god Thoth miraculously ‘filled’ or ‘completed’ the eye, joining together the parts, whereby the eye regained its title to be called the wd3t, ‘the sound eye’. Presumably the missing 1/64 was supplied magically by Thoth. This is my retelling, using many of the same phrases, of Sir Alan Gardiner’s account of the ‘eye of Horus’ symbol used for notating measures of corn and land in his classic Egyptian Grammar (§ 266.1; 1927: 197). It’s a nice story, and it is repeated again and again, not only in wacky Egypto-mystical websites but in a lot of serious scholarly work up to the present day. I talk about it in Numerical Notation. But is it true? Well, that depends what you mean by ‘true’, but mostly the answer is: not really. As I mentioned in a post back in 2010, this is certainly not the origin of the symbols. Jim Ritter (2002) has conclusively shown that these are ‘capacity system submultiples’, which originated in hieratic texts, not hieroglyphic ones, and appear to have had non-religious meanings originally. Even while insisting on the mythico-religious origin of the Horus-eye fractions, Gardiner himself (1927: 198) is crystal clear that all the earliest ‘corn measures’ are hieratic. The hieratic script is very different in appearance and character than the hieroglyphs, being the everyday cursive script of Egyptian scribes, rather than the monumental and more formal hieroglyphs. Ritter shows conclusively that in their origin, and their written form, and their everyday use, the capacity system submultiples have nothing to do with the Eye of Horus. Ritter distinguishes this “strong” thesis from a “weak” version, in which, many centuries after their invention, the hieratic capacity system submultiples were imported into the hieroglyphic script and that some scribe or scribes wrote about them as if they could be combined into the wedjat hieroglyph. This weak version has more evidence for it, but as Ritter points out (2002: 311), this “does not automatically mean that ‘the Egyptians’ thought like that; for example, those Egyptians whose task it was to engrave hieroglyphic inscriptions on temple walls. Theological or any other constructs of one community do not necessarily propagate to every other; the Egyptians were no more liable than any other people to speak with a single voice.” This is a sociolinguistically-complex, reflective view that I think is essentially correct, and which I adopt in my work (although I would rewrite it today to be even clearer, as I hope I have above). Ritter is not fully convinced by the weak thesis either, but acknowledges that it is tenable. Ultimately, as Ritter concludes (correctly), our willingness to buy into the ‘Horus-eye fractions’ model tells us a lot about how we view the hieroglyphs, and Egyptian writing in general, as mythically-imbued and pictorial in nature, and ultimately reflects a mythologized view of Egyptians as a ‘mystical’ people, an ideology that goes back to the Renaissance and earlier in Western thought (Iversen 1961). But I would go further, because it is about more than just Egypt. We like stories that give numerological explanations for numerical phenomena, regardless of their veracity, and especially where the numerical system under consideration is from societies we conceptualize as having a more mystical or mysterious relationship with the world than we purportedly do. Very often we are projecting our image of what is going on. This isn’t to say that Gardiner’s description is wrong – he knew the texts better than almost anyone, and correctly identifies how the system worked and the texts in which it was found. But it’s important that when (some) Egyptians transliterated the capacity system submultiples from hieratic to hieroglyphic writing and formed them into the wedjat, they were repurposing and transforming a pre-existing set of signs that had no mystical origin whatsoever. It deserves our attention, both for what it tells us about Egyptian life and also for its importance for the historiography of science, mathematics, and religion in non-Western societies. Gardiner, Alan H. 1927. Egyptian grammar: being an introduction to the study of hieroglyphs. Oxford: Clarendon Press. Iversen, Erik. 1961. The myth of Egypt and its hieroglyphs in European tradition. Copenhagen: Gad. Ritter, Jim. 2002. “Closing the Eye of Horus: The Rise and Fall of ‘Horus-eye fractions’.” In Under One Sky: Astronomy and Mathematics in the Ancient Near East, edited by John M. Steele and Annette Imhausen, 297-323. Münster: Ugarit-Verlag. We in the West tend to take for granted, today, that really there is only one numerical system worthy of attention, the Western or Hindu-Arabic system, which is normatively universal and standardized throughout the world. We also tend to feel the same way about, for instance, the Gregorian calendar. That’s a little sad but not that surprising. But we also take it for granted that, in general, throughout history, each speech community has only one set of number words, one script, and one associated numerical notation system. Of course, a moment’s reflection shows us this isn’t true: virtually any academic book still has its prefatory material paginated in Roman numerals, not to mention that we use Roman numerals for enumerating things we consider important or prestigious, like kings, popes, Super Bowls, and ophthalmological congresses. And this is not to mention other systems like binary, hexadecimal, or the fascinating colour-based system for indicating the resistance value of resistors. I’ve complained elsewhere that we put too much emphasis on comparing one system’s structure negatively against another, but to turn it around, we should ask what positive social, cognitive, or technical values are served by having multiple systems available for use. We need to be more aware that the simultaneous use of multiple scripts, and multiple numeral systems, simultaneously in a given society is not particularly anomalous. In Numerical Notation (Chrisomalis 2010), I structured the book system by system, rather than society by society, which helps outline the structure and history of each individual representational tradition, and to organize them into phylogenies or families. But one of the potential pitfalls of this approach is that it de-emphasizes the coexistence of systems and their use by the same individuals at the same time by under-stressing how these are actually used, and how often they overlap. Just as sociolinguists have increasingly recognized the value of register choice within speech communities, we ought to think about script choice (Sebba 2009) in the same way. With numerals, we also have the choice to not use number symbols at all but instead to write them out lexically, which then raises further questions (is it two thousand thirteen or twenty thirteen?) – many languages have parallel numeral systems (Ahlers 2012; Bender and Beller 2007). We need to get over the idea that it is natural or good or even typical for a society to have a single language with a single script and a single numerical system, because in fact that’s the exception rather than the norm. The stamp above is a quadrilingual text (French, Arabic, Latin, Egyptian) in three scripts (Roman, Arabic, hieroglyphic) and four numerical notations (Western, Arabic, Roman, Egyptian). We should think about the difficulty of composing and designing such a linguistically complex text – it really is impressive in its own right. We should also reflect on the social context in which the language of a colonizer (French), the language of the populace (Arabic), and two consciously archaic languages (Latin and Egyptian), and their corresponding notations, evoke a complex history in a single text. Once we start to become aware of the frequency of multiple languages, scripts, and numeral systems within a single social context, we have taken an important step towards analyzing social and linguistic variation in these traditions. Ahlers, Jocelyn C. 2012. “Two Eights Make Sixteen Beads: Historical and Contemporary Ethnography in Language Revitalization.” International Journal of American Linguistics no. 78 (4):533-555. Bender, Andrea, and Sieghard Beller. 2007. “Counting in Tongan: The traditional number systems and their cognitive implications.” Journal of Cognition and Culture no. 7 (3-4):3-4. Chrisomalis, Stephen. 2010. Numerical Notation: A Comparative History. New York: Cambridge University Press. Pot, Hessel. 1999. “Roman numerals.” The Mathematical Intelligencer no. 21 (3):80. Sebba, Mark. 2009. “Sociolinguistic approaches to writing systems research.” Writing Systems Research no. 1 (1):35-49. 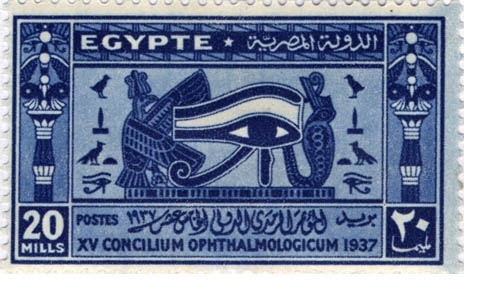 To the best of my knowledge, this Egyptian postage stamp, along with the two other denominations in the same 1937 series (5 mills and 15 mills), are unique in a very specific way. My puzzle to you is: what makes these stamps so special? Place your guess by commenting below (one guess per person). If you are the respondent with the correct answer, your ‘prize’ is that you may ask me any question relating to the themes of this blog and I will write a separate post on that subject. Happy hunting! Edit: Well, that didn’t take long. In just over 20 minutes, Dan Milton successfully determined the answer. In case you still want to figure it out on your own, I won’t post the answer here in the main post, but you can find it in the comments if you’re stumped. I will follow up with some analysis later. You may have noticed that I have (very slightly) changed the subheading for Glossographia from the former ‘Anthropology, linguistics, and prehistory’ to the new ‘Anthropology, linguistics, archaeology, and writing systems’. I don’t actually post on prehistoric archaeology very much at all, but I do post on the archaeology of literate societies reasonably often. And, in particular, I post on issues in epigraphy, writing systems, and literacy very often, so I thought it fitting to promote that subject to its current place of prominence. Unfortunately, in my experience, there just aren’t that many blogs that focus on issues relating to writing systems and literacy. Sure, each regional archaeological tradition in the ancient world has its blogs that occasionally discuss textual evidence, inscriptions, paleography, and so on – some of them, like Rollston Epigraphy, do so regularly, others sporadically. Even then, I don’t know of any academic blogs that focus on cuneiform or on Egyptian hieroglyphs (though I’d love to be shown to be wrong). And of course, Language Log and other general linguistics blogs do occasionally touch on written language. But in terms of actual academic blogs that are dedicated in part or in whole to writing systems (their typology, their history, their linguistic features) or literacy (the social and cognitive context and use of writing), there isn’t that much out there. Maya Decipherment is the most prominent, surely because of the importance of David Stuart in the field. There’s BabelStone, where Andrew West has, very quietly, been blogging for eight years on Ogham, on Central / Inner Asian scripts, and on issues relating to typography and Unicode. The wonderful Shady Characters focuses specifically on punctuation – check it out – it deserves a massive readership. The Omniglot site covers writing systems in some detail, and the corresponding blog does sometimes cover issues in writing systems. Years ago we used to have Abecedaria, which had general information on writing systems with a focus on the ancient Near East and Levant, but it’s long defunct. Michael Everson used to blog about the letter þorn at þorn.info, but that’s been quiet for a year or more. And … well, that’s about all I know of or read regularly. Do you know of any others? So, the change in the header does not reflect an actual change in what I’ll be posting, but is simply a recognition that there really is a need for a blog with a focus on general issues on writing systems and literacy, and that since 2008, this has been one of a relatively small number of places that actually does that. Is the Voynich Manuscript structured like written language? This week has seen a bumper crop of news stories about a new piece of research in PLOS ONE by Marcelo Montemurro and Damian Zanette, who are both physicists who specialize in complex systems. The paper in question is not about physics, however, but argues that the mysterious Voynich Manuscript has properties that suggest that it has language-like structure, based on an information-theoretic analysis of the structure of its words. If correct, while this is certainly not a ‘decipherment’, this result would be counter-evidence to certain versions of the theory that the VM is a medieval hoax that is undecipherable because it is pseudo-writing, meant to have the appearance of language but having no decipherable content in any natural language. Now, I am not a specialist in information theory, and I’m not truly a specialist on the Voynich Manuscript (although I have played one on TV), but I am a linguist and I do research on writing systems and allied representation systems like written numerals. And several things bother me about this paper. The first is that, as Gordon Rugg (the most significant modern proponent of a ‘hoax’ theory) has pointed out in a comment on the new paper, no one is seriously claiming that the VM is pure ‘noise’ – it clearly is structured, and simply because the VM has some structure, even one that resembles language in some ways, does not entail that it is likely to have a genuine linguistic structure, much less a decipherable one. Rugg’s own (plausible) theory involves the use of a medieval ciphering system to rapidly produce language-like but meaningless text as part of a hoax, and Montemurro and Zanette have not evaluated this theory at all, as far as I can see, other than to dismiss it. Furthermore, the only systems to which the VM is compared are two written languages in alphabetic scripts (English and Latin), one written language with a non-alphabetic script (Chinese), one computer language (Fortran), and one natural sequence (yeast DNA). But there are a wide variety of nonlinguistic, quasilinguistic, and paralinguistic phenomena aside from these, and they haven’t compared the VM to any of them. Montemurro and Zanette show conclusively that the VM has much more ‘information’ (structure) than the yeast DNA, which we would anticipate, but does not do a good job of accounting for the different types of encoded information, and structured non-information, which might be comparable to the VM. What is the information structure of known codes and ciphers (both broken ones and undeciphered ones)? What is the information structure of semasiographic systems like the glyphic system at Teotihuacan? What is the information structure of the linguistic productions of psychiatric patients who suffer from graphomania? What is the information structure of pseudo-writing like the Codex Seraphinianus which we know (since it’s a modern piece of conceptual art) carries no message? None of these comparisons would be conclusive but all of them would be informative. Right now the range of systems to which Montemurro and Zanette have compared the Voynich is simply too limited to be useful. Montemurro and Zanette are also seemingly unaware of parallel efforts to use the information structure of undeciphered scripts to evaluate their language-like nature. Two of the most significant such efforts are the effort to show that Iron Age Pictish graphic symbols from Scotland constituted a phonetic script (Lee, Jonathan and Ziman 2010) and efforts to show that the Indus script of Harappan-period India and Pakistan either does (Rao et al 2009) or does not (Farmer, Sproat and Witzel 2004) resemble linguistically-based writing systems. These theories have attracted a reasonable degree of attention from linguists, and Richard Sproat, in particular, has done a lot of work trying to address the non-linguists’ methodological and conceptual approaches, some of which has been covered in extraordinary detail at the Language Log. There’s a much longer discussion to be had there, but suffice it to say that most linguists are skeptical of studies undertaken without any linguistic expertise and assistance. Again, without taking a position on any of these controversies, it strikes me as irresponsible literature-searching that the Montemurro and Zanette study is so fundamentally unaware of similar efforts in major publications such as Science and the Proceedings of the Royal Society. If you’re going to use physics to study written language, even if you’re going to ignore every single linguist who’s written on these subjects, maybe you should at least be aware of high-impact articles written in the last ten years by physicists using very similar methods to your own. For the record, I think that any information-based effort that does not involve linguists at a serious level is likely to make invalid assumptions and thus be highly prone to producing nice-looking gibberish. For example, the Montemurro/Zanette theory seems to grant that the VM probably does not encode information alphabetically like English, and then suggests instead that it recalls “scripts where -as in the cases of Chinese and hierographical Ancient Egyptian- the graphical form of words directly derives from their meaning.” (Montemurro and Zanette 2013: 4). Let’s assume we are prepared to set aside their use of the term hierographical, which is a bizarre nineteenth-century anachronism that was vaguely popular for a time prior to the decipherment of the Rosetta Stone, but which has never, in any European language, been a preferred term. More significantly, it is a gross, entirely improper characterization of Chinese and Egyptian to argue that the “form of words directly derives from their meaning”. Both scripts have massive phonographic components with some representation of morphemes, words, and semantic categories with signs, as every expert on writing systems has known for thirty years or more – certainly the work of John deFrancis shows this eminently clearly. Even lumping the Egyptian hieroglyphic and Chinese scripts together in a single category ignores the massive differences between them. So in essence, Montemurro and Zanette seem to be suggesting that the VM has properties similar to no writing system ever known to have been used on earth, because they do not seem to know what sorts of writing systems they are comparing things to. In short, I’m afraid what we have here is another case of non-specialists applying the methods of one field inappropriately to some actually complex linguistics problems to evaluate a text whose decipherers (a group riddled with charlatans and cranks) have offered us everything except an actual decipherment.